This paracord survival bracelet is adjustable with a Velcro strap and comes with a metal wire chain saw inside! The buckle has a flint rod and a flint scraper! Enjoy being about to cut down branches in a survival situation. BE PREPARED FOR ANY OUTDOOR EMERGENCY with the Holtzman's Gorilla Survival paracord bracelet! Our multipurpose survival tool comes equipped with all the essential accessories for a fuss-free and safe outdoor adventure! If you are planning your next hunting, fishing, camping, trekking or hiking trip, this paracord bracelet is a must-have! 7 DIFFERENT SURVIVAL TOOLS FOR THE PRICE OF JUST ONE! Our heavy-duty paracord bracelet features 7 essential outdoor survival tools, including 1 x wire saw, 1 x Emergency Whistle, 1 x Ferro Rod, 1 x Flint Scraper/Cutting Tool, 1 x duct tape, 1 x Velcro strap, and 550 Paracord that will help make camping, fishing, or hunting a breeze! MAKE YOUR OUTDOOR ADVENTURES AS SAFE AS POSSIBLE with our lightweight, practical and convenient paracord bracelet, which is designed to help take all the fuss out of your fishing or backpacking trips. Plus, you can easily attach it to your backpack, belt or wear it on your wrist, and enjoy your summertime or winter outdoor trips with confidence! SURPRISE YOUR LOVED ONES WITH A THOUGHTFUL GIFT! Do you want to keep your friends and family safe at all times? 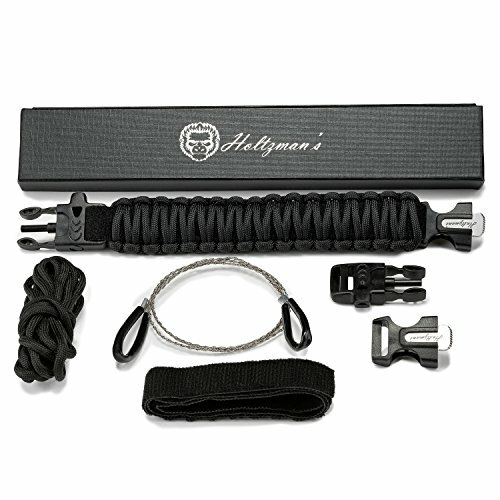 Spoil your husband, boyfriend, son, brother, father or grandfather with the Holtzman's Gorilla Survival 7-in-1 paracord bracelet and make sure that they always have an emergency survival multitool with them! GET YOUR PARACORD BRACELET NOW 100% RISK-FREE! That's right! If you are not 100% flabbergasted with your safe, sturdy and problem-solving emergency paracord bracelet, we promise to buy it back from you at full price. No questions asked! What are you waiting for? Prepare yourself for your next great adventure! If you have any questions about this product by Holtzman's Gorilla Survival, contact us by completing and submitting the form below. If you are looking for a specif part number, please include it with your message.